Question I often get asked is... "steaks, where is the best?" Seriously, I get that question all the time and automatically offered up a super blase answer of "Black Angus?". There is one place I am proud to go and have no problem in shelling major bucks in this regards. 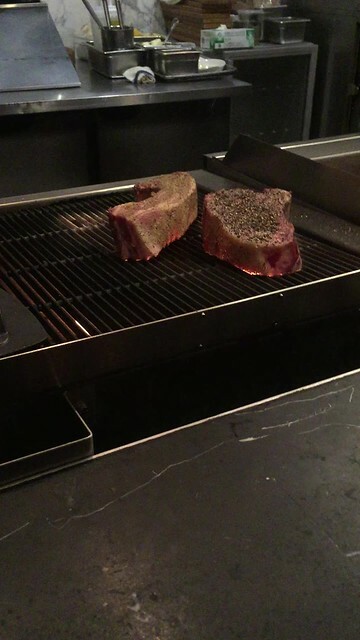 Honestly, It's this place was the only steak I am willing to go for as I can see them up grilled close and personal on their work station in the open kitchen. That place would be here at Chi Spacca, part of the immensely popular Mozzaplex. If you ever been to Mozzaplex, which is like 4 places within close proximinity of each other on that Southwest corner spot of trendy Melrose Avenue and desirable Highland Avenue. This corner included the tourist trap of pizza machine of Pizzeria Mozza, fine Italian courses of Osteria Mozza, the order-to-go take out counter of Mozza2Go, and this meat-centric cozy little restaurant of Chi Spacca. The thing to remember about dining in on the 3 big names restaurants above (minus the 2Go) was that it might take a good reservations ahead of time for busy weekend evenings. 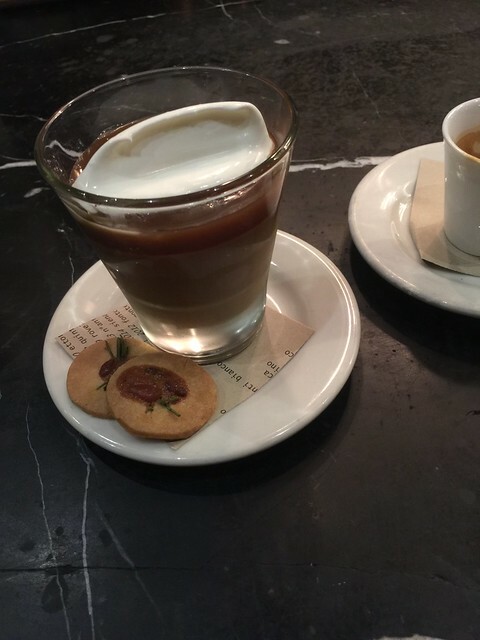 I often made the mistake in thinking I could just strolled in to Chi Spacca and immediately think I can be seated at one of their counter even though it was next to impossible (so said on table reservation on their website). Lessons would be learned when I was denied twice for Saturday evenings. The catch of it was simply that I had to put down a deposit for reservation. Obviously if I no-showed or canceled too late, then the business would lose out on a bill that evening. So without hesitation, they would charged that deposit at the end of the night. It's more than a guarantee assurance for the restaurant and a hindrance for the rest of us diner who are not fully committed days ahead. 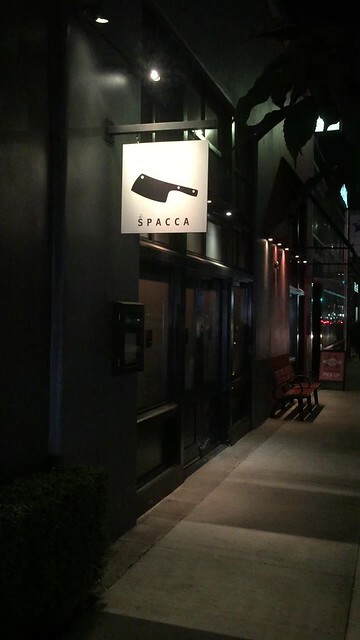 Once you are ready to go, You would just need to head over to the location of Mozza2Go, where Chi Spacca is jointed with the take out space/accessories store. You would noticed something out of place right away as the hostess with her stand is standing by a left side wall by the store of Mozza2Go and would greet the patrons of Chi Spacca that arrived for their reservations. The side wall with an obscure seen door handle would popped open for the diners to be seated at the tables on the other side of the wall. My best description out of that would be like going to a speakeasy, but for a steak or Italian dinner. 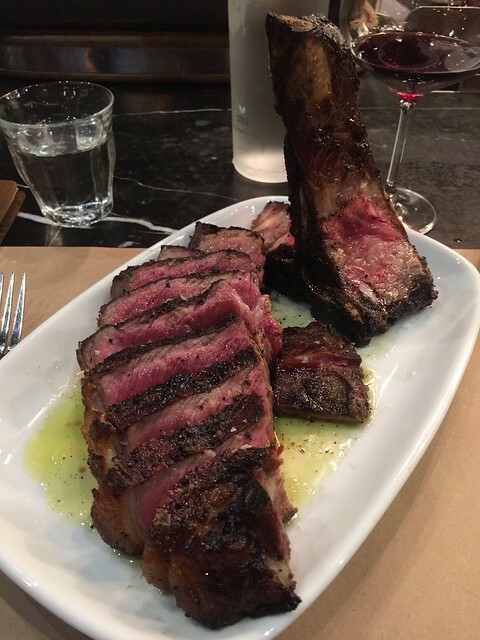 I often prepared to sit by the counter seat close to the grill as I can see the action of how the steak are prepared and how the buzzy action of the kitchen staff prepared their menu items of pasta, pizza, or steak are worked. It's an eye-popping experience that will only leaved you impressed when you get to take it all in. The steak as it is was everything you wanted. The way the cook prepared with seasoning and checking the temperature on the meat when it was on the grill was immaculate. Coming out and even cutting it to be plated was beautifully done. The presentation in this was on point. In fact, throughout the night, every steak was expertly mobilized to be evenly presented when arriving to the diners. 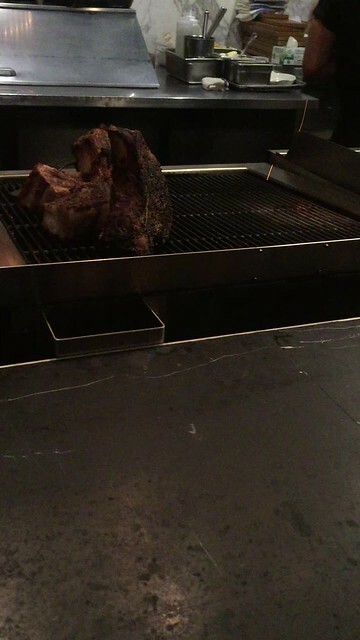 The steak that I placed the order was a 42 ouncer of a Dry Aged New York steak. My gosh, if you see the result of this, you will be in love by staring at it. It also didn't take long for it to be devoured as well. Would have gone great with a red wine, but we wasted no time in finishing this bad boy. My other highlight of the night was their burrata that was imported directly from Italy. My gosh, so creamy when this was popped open for the world to see. 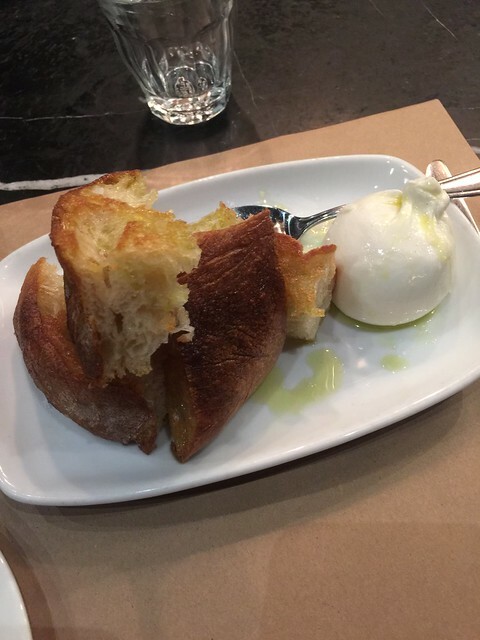 The toast was also grilled to be crispy, perfect to be a compliment to that burrata that you'll be ecstatic about. The perfect ending to this dining experience has to be their desserts. Getting anything less from a Mozza restaurant would be a shock. The butterscotch budhino was the right call on this night. Rich and decadent, a sweet contrast that settled nicely after a hearty meal. Here's the deal about coming here was that this restaurant was prominently featured on Netflix's Chef Table as the star chef Nancy Silverton explained her love of Italian cuisine in her life. 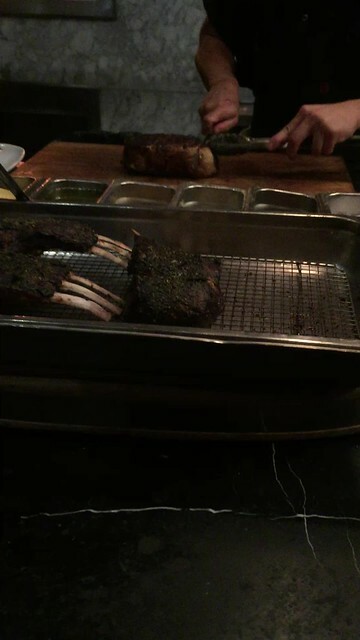 It was more of her life story, but this restaurant on the show got me because of how the steaks was prepared and showed for display on the screen. There was just no way I was missing out on this. If I saw that episode on Netflix... just imagine on how many others might have. Not just Los Angeles, but the world. So this will be a sticker shock on the wallet and many others will be happy to replace you on the reservation. For that question above, no doubt about where to go for that best steak.